Last week was my first week taking part in Meal Planning Monday and it was a complete success. I managed to stick to the plan all week, and it worked brilliantly. I'd taken into account my complete lack of energy on Wednesday and Thursday evenings, therefore planning food which Mr. TheBoyandMe could reheat/cook from scratch with ease. Everything else was easily managed and I didn't have that flagging feeling come 5pm when I needed to start cooking. This week is going to be a little less regular as we have a few interruptions with Mother's Day, Mr. TBaM's birthday, and his parents coming down to take us out for lunch on Saturday. That meal will probably be Pizza Express because The Boy eats the entire meal with ease, and therefore I'll do a lightweight salad buffet for tea that night. Therefore we're having a Chinese take-away meal for a treat on Friday! Sunday: Slow-cooked gammon in cider for the omnivores, cheese souffle (from Asda) for the veggies, sauté potatoes, leeks in cheese sauce. 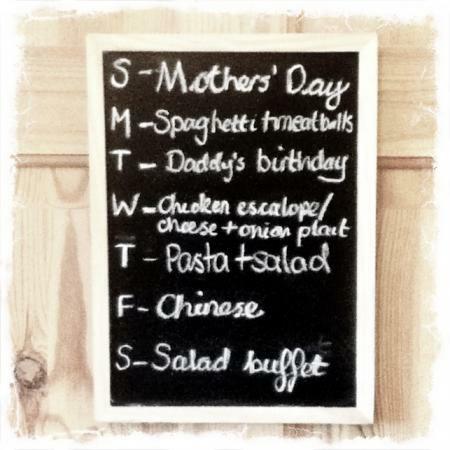 I'm linking this up to Meal Planning Monday over at At Home With Mrs. M.
Any meal plan involving a Chinese gets my vote! I really need to try meal planning. I so often lack inspiration for our evening meals and we end up eating the same things over and over. I might give it a go next week and see if it helps to inspire me. The Scan swedish meatballs from Asda are on a par with the Ikea ones…and much cheaper, especially when they're on special….I load up the freezer with them then!